Stormers coach Allister Coetzee says he was proud of the effort that his players put in against the Reds but ultimately he was left lamenting crucial mistakes in their 22-17 loss. The Stormers will fly back home to South Africa on Sunday after four tour losses in Australasia and only one win from six matches. “We played so well at times (against the Reds)… only for crucial mistakes to cost us again, ” said Coetzee. “I still believe that we have the ability to beat any team (we play against), unfortunately we’re still making the same mistakes at crucial moments. It’s been our trend, but it’s something that we can rectify. “Our line-out let us down today and we made a few mistakes in trying to run the ball back from deep in the second half, but I cannot fault the players’ effort… the effort is there! The Stormers have 10 league matches to come, seven of which are at home between now and mid-July. “We’ve played at home just once this year, in six games, ” Coetzee said on the Stormers site. Unfortunately, experienced backline star Gio Aplon will be out of action for some time with a dislocated elbow, having left the field in the 23rd minute after falling awkwardly in a tackle. 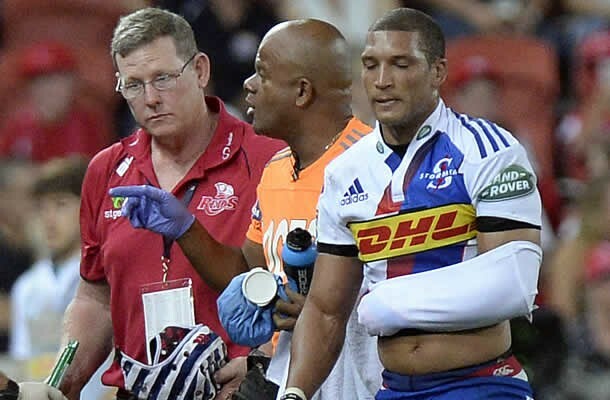 “Gio dislocated his left elbow and, at this stage, it seems that he will be out of action for six to eight weeks, ” said Coetzee. “It’s obviously a blow to lose someone of his ability and experience, but one bit of solace is that it’s not a fracture. The Stormers will land in Cape Town on Sunday evening and will resume training on Tuesday. They host the Waratahs on Saturday.